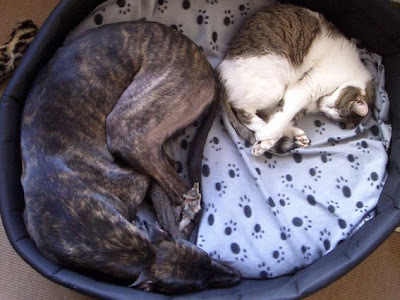 One of the positive things we’re doing for next month’s mag is we're including a great article from Greyhounds4U on how to make Greyhounds cat-friendly and what I'd like is to show loads of pictures of Greyhounds with cats, rabbits, small dogs to reinforce the message that not all Greyhounds will be problematic. Please email me your best pix of Greyhounds with other pets and approx 100 words telling me something positive about your rescue Greyhound. We've already got so many letters telling us what's wrong with Emma Milne’s article that all the salient points are well covered. Plus we can also include a few stories from people who know their dog has chase issues, but how their dogs can still live a very happy life without putting anyone in danger. Here’s our standard photo spec blurb from our designer just so any techy people will know what to do! • Ideally please supply 300dpi jpegs. Please clearly mark the name of the feature in the subject line and if sending several batches, please number them sequentially too. • The bigger the file size the better so we have scope to use up to full page if necessary. • If taking digital photos please ensure the camera is set to the highest resolution setting. • Minimum file size when compressed as a jpeg should be around 500k – but the bigger the better. Full page size 300dpi jpegs will be around 1.6mb when compressed to “high quality”. • If you prefer to send photos on CD or DVD via post, please email me for a postal address so I know to look out for the pix. Here's one of the lovely pix already received! We are planning other things, so don’t think this is all we are doing. This is just something you can help produce and be a part of. Once again, sorry about this folks. We're working on next month's package and a much bigger project too for the future. Again, I ask - are you going to continue to commision this woman to write for the magazine? Thank you Beverley, I hope that the many hundreds of unhappy people will write a line under what has happened in your case, in recognition of your genuine dismay at this articles response. I personally believe, that you are genuine in your dismay and horror. I'm not so sure 'Emma the TV Vet' will get any positive response until she openly recognises the damage she has done, however let us hope. I don't have any photo's of my Mo with small animals but can get very many people to let you know how gentle she is with children, other dogs and even cats - though understandly, not in her garden! I don't know if that counts/helps! She's also hoping to be a blood donar like her dad! Anyway, if you would like a long legged blonde beautiful, friendly and gentle hound - she's free for photo's!! Thank you - you have had a hard few days, I'm sure. Anon, lay off. We're all upset with Emma, goodness know I was fuming and hope she's not allowed to write for DT again! I'm sure we will find out soon but leave Beverly to get on with her fantastic magazine and helping to put right the damage done. Beverly, chin up. We all know how upset you are and you're only getting the brunt of all this because you've been strong enough to stand up and apologize. I for one have not been put off adopting one (or two!) of these beautiful animals as soon as I am able. So glad you havent been put off adopting a hound or two Becca, you won't regret it. Oh and the first comment on here, anonymous, back off now, I think enough has been said now. Dont let everyone think us greyhound owners are all complete eejits! We were all mortified at Emma's write up but Beverley is doing what she can now to rectify things so leave off. Is it within Beverley's power to refuse to commission Emma Milne for any further articles? If it is, and Emma Milne is used again as a contributor, I will not believe that as Anonymous says 'Beverley is doing what she can to rectify things'. Beverly, how about an article on greyhound blood donors too? I know quite a few greyhounds who have literally saved the lives of other dogs. Helen. This article has damaged not only the reputation of the Greyhound, but has put back rehoming by years. To ask "what do you want from me?" is just a pathetic question, when so many of the questions others have asked have gone unanswered. I will ask what someone has been asking all the way through and that is are you going to commission this woman to write for the magazine? A simple answer is something people obviously want from you, but as you are not reading as often as you were you probably won't be replying for a while either! Too busy again hmmmm! I am having major problems logging in, but after trawling through the previous blog it is very obvious to me that Beverley is very sorry as to what happened. Mistakes do happen and if anyone thinks that they are without fault then they are very wrong. Yes, she is the editor of the magazine, but, having read the magazine for many years and seeing the wonderful work that this magazine has done for all sorts of breeds that get bad press, this one incident should not force her to resign or any such nonsense. I used to own a Greyhound who was great with small animals, cats and children. Other dogs (apart from his pack) were targetted by him and we spent many years walking him on lead and muzzle. He was my soulmate and he died 3 and a half years ago and it was only yesterday that my mum mentioned him just for me to get upset and have to change the subject. When he died, it was like a chunk of my heart had been ripped out and stepped on. Many people feel this way about their Staffies, Rotti's, Dobes and certain crosses that we dare not mention. They are also targetted and I spend many hours trying to convince people that the media hype isn't true. I also spent over a year and a half of my teenage life trying to convince people that similar types of media hype was not true of Greyhounds being that I worked at Greyhound Welfare and spent alot of time convincing people that they were not blood-thirsty killing machines. I have changed jobs now and recently Beverley was very concerned with a dog that was in the councils care who was about to be put to sleep. She tried all available avenues to try and save him and save him we did!!! There is no way that this woman would spend 18 years on a magazine and not care! I run my own rescue and have made mistakes that I could kick myself for. This mistake was that she did not proof read an article written by someone who she should have been able to trust. I highly doubt that this will ever happen again, but I know all too will how things can run away with you and there are not enough hours in the day. Just stop going over old ground and try to help towards righting the wrong. When I was in business and made an error I did not get upset, wring my hands and ask clients what they wanted from me, sitting back waiting for a brain-storming session for suitable ideas. I took immediate and sometimes ruthless action to regain client confidence. Severing a mutually lucrative association with Emma Milne may be messy. Not as messy as the deaths of the next wave of 'Devil Dogs', brought to you courtesy of Emma Milne and Dogs Today. I'm not trying to be mischievous but why are people so convinced that this article has put greyhound rehoming back by years? I'd like to think that I'm not alone amongst DT readers in that I would not make a major decision on the basis of one person's personal experience. I don't feed my dog a specific food on the basis of one vet's opinion, I don't make decisons re vaccines on the basis of one opinion, I don't choose insurance on the basis of an advert. Emma has written things before that I don't agree with, she has also written things that I do agree with. Responsible dog owners weigh up issues before making decisions. If someone was making a decision to rehome or not on the basis of one person's opinion I would seriously question that person's fitness to rehome the dog. I'm not condoning or condemning Emma's article but I would repeat what I said in an earlier post - DT has taught me all I know about greyhound re-homing and that has been overwhelmingly positive and remains that way because one person's opinion doesn't negate the general whole. I really cannot see that people will make a decision on Greyhounds being unsuitable pets on one article written. I will report back here if I hear any negative attitudes towards Greyhounds because of this article and being that I work with dogs and people 7 days a week it is likely some comment will be made if it has made that much of an impact. In fact with all the links that have gone up, it is more likely that people have unknowingly advertised this article more than if little was said. the type of people who use dog internet forums probably wouldn't choose a dog based on a DT article. However once the magazines are purchased they are out in circulation they may be read, obviously, by those who would not hear a balancing viewpoint. The damage is done once the copies are in circulation. For those people calling for the subject to be dropped: the result would be that Ms Milne and DT magazine would breathe a sigh of relief and declare the reaction a storm in a teacup. Aint gonna happen! To quote Rattus Rattus: However once the magazines are purchased they are out in circulation they may be read, obviously, by those who would not hear a balancing viewpoint. The damage is done once the copies are in circulation. This is exactly the problem and the aftershock could actually do more damage than the first reactions to the article. Most people working in business would probably be well in their bike by now! NOW is the time to readdress the balance and work towards making something positive come out of the whole horrid debarkle. I own a grey who is diffcult with other dogs and is rather "keen". I adopted him through G4U. Together with their unfailing support and advice he is improving and is quite a different dog one year down the line. I fully intend to write and send DT an article based on our first year experiences with him and how even a keen greyhound can still make a loving and enjoyable pet. Incidentally, I also own 2 rabbits and 37 chinchillas. Whilst he does not actually live with them (they have their own accomodation in a converted garage) - he is gradually becoming desensitised. Anyway, although I am sure that this will not go away, anything positive that can be done to promote greyhounds, going forward, seems to me to be the way to go. Rehoming Greyhounds is a mammoth task as it is, this article really hasn't helped. Beverly has apologised and that's fair enough but she didn't write the rubbish did she? As far as I'm concerned this vet who says what she thinks might as well say get rid of staffies, they all kill children. 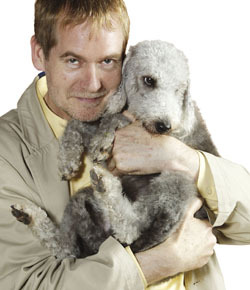 I was bitten badly as a child by a Beagle can we get rid of them too? My friends Rhodesian ridgeback once killed a squirrel lets do away with them, my mum had a GSD that ate a budgie so lets get rid of them, lurchers are bred for hunting so lets wipe them out while we're at it. Can we rid the place of all cats too as they kill cute little mice and birds? I could go on but you see I'm making about as much sense as the oh so intelligent vet arn't I? Anyone with any intelligence and a shred of knowledge of greyhounds won't be put off by reading the article, but if it makes just one person who was thinking of adopting a greyhound think twice then the damage has been done! A couple of thoughts - Perhaps if someone is naive enough to home any breed on the basis of one article then perhaps they are not really suitable for the possible 15 year committment, so this article may have weeded out some unsuitable rehomers. On the other hand, DT has built such a good reputation for providing correct breed information (eg the breed profiles) that readers trust what's printed. That's why I disagree to some extent when people say a columnist can write what they like. I don't think a reader necessarily separates the view of a writer and publisher. I can see that Beverley has not decided to answer the repeated question as to whether EM will continue to write in DT and can understand it's a difficult decision to make. I confess I haven't read EM's previous columns so don't know how valuable it has been in the past to dog welfare. However, I can't help thinking that even with a retraction and redressing in the next issue, if EM continues to write in DT it will affect the reputation of the rest of the magazine, because readers will know it is using a writer whose opinion cannot be trusted. Will the reader not ask what other features in the magazine contain inaccurate content? I'm positive readers can forgive one publishing error in fifteen years if DT's response to it is strong enough, but if EM continues to write for DT I can't help feeling DT's outstanding reputation will be compromised. Really not trying to continue the rant at all - just food for thought. "Anyone with any intelligence and a shred of knowledge of greyhounds won't be put off by reading the article, but if it makes just one person who was thinking of adopting a greyhound think twice then the damage has been done!" I wholeheartedly agree with the first part of this statement. If however, it causes someone thinking of adopting a greyhound to think twice then isn't that a good thing - they can then go and look at some of the sites that have been listed on this blog and see the reality for themselves and make an informed decision. Surely better to rehome to an informed owner than to someone who doesn't understand the breed and risk another tragedy? Everyone I have met when out with my dog who has seen the article saw it for what it is - one person's opinion. When asked if it altered their opinion of greyhounds the response has invariably been incredulity - since when has one owner's irresponsible actions led to other owners condemning a breed? Yes, I can understand the anger but I think the damage has been self-inflicted on the author rather than on the breed. "When I was in business and made an error I did not get upset, wring my hands and ask clients what they wanted from me, sitting back waiting for a brain-storming session for suitable ideas. I took immediate and sometimes ruthless action to regain client confidence." Unlike you Rattus, I am always upset when I make an error and I'm certainly not ashamed of it! That may be why I'm still the editor of a dog magazine after 18 years and not running Amstrad! I have asked the people most affected by the error to let me know what I can do to put it right - not to hoodwink them into thinking I'm doing something when I'm not, but to genuinely try to make things better and come up with something more meaningful than a knee-jerk tokenistic gesture to get people like you to give me less ear-ache. The article in itself was a knee-jerk reaction - the solution shouldn't be. And who exactly are you rattus rattus? What is your agenda? Why is killing off Emma of more interest than rectifying the damage done? And I just don't understand why you imagine the relationship I have with my contributors is so very lucrative? We pay them very little, they certainly pay me nothing. I'm not writing this from my boat in the Med. You don't do a dog mag for 18 years for the money!!!! It is ideology that stops me bowing to mob pressure and holding a messy public execution. It would be easy to start throwing stones at Emma and burning her at the stake afterwards - but would it actually achieve anything at all for Greyhounds? I dislike the culture of punishment preferring reward based methods. Believe me Emma is hurting. You are getting to her - she knows the strength of feeling. How much do you want her to hurt before you say she's hurt enough? Where does it end? Do you want her in the Priory having a breakdown? Will that be good enough? I just don't see why the focus on whether or not she gets fired and wanting it in the public domain! I happen to hope that Emma will be radically educated by what has happened, that she will cannot help but learn from what has happened. I happen to believe that all people are capable of change - even you rattus. I reckon if we had a chat we'd find some common ground, that you'd stop fighting with me and we'd pull in the same direction, eventually! I'm sure we want some of the same things. The short term enjoyment of casting her out and making her suffer is an instinct I'd prefer not to give in to! Hope you now understand, Rattus - not wanting to in any way inflame you and no I'm not coming back for a 15 minute argument. Need to focus on the future and putting things right. Well said Beverly. This is the reason why I keep reading Dogs Today and stopped with Your Dog. Because the articles are fascinating and you do a hell of a lot for dogs and dog welfare. I can't speak for everyone else but I personally don't want any harm to come to Emma for what she has written but surely you have to think about the repercussions on the DT. I certainly wouldn't trust anything she writes in the future, if she can write a knee jerk article based on nothing but her own personal feelings and not facts then all her articles from here on in lack any credibility. She certainly is entitled to her own opinions but when she is writing in her capacity as a vet she needs to remember that people will take her words as facts. I agree that anyone rehoming a retired racer should take more than one opinion on greyhounds but one badly written and totally biased article will outweigh numerous good ones, it will be the one to stick in the mind and that, in my humble opinion, is what the problem is. It is very frustrating to hear from Beverley that Emma is suffering too and yet she still doesn't apologise. We can only presume that she is still standing by what she has written and therefore the situation sadly continues. Come on Emma, show everyone that we're wrong, back Beverley up the way she has backed you up....apologise! Just out of interest does anyone know whether Dogs Trust has released a statement considering EM is a trustee and their pledge is never to destroy a healthy dog? Jsut discovered EM is also trustee of Tailwaggers. I've read your comments Beverley about EM hurting right now. Does that mean she regrets what she wrote? She still has time to change the situation! Do you not think that she is continuing to waste an opportunity to the many new visitors to her site there must have been recently? If she publicly retracts the article, even now, explains that she was writing emotionally, and posts positive articles about Greys, rehoming centres, behavour management, better suggestions regarding changing the racing industry etc. on her site (perhaps with some PR guidance from you) she could really change this mess into some positive discussion and action for greys and stop embarrassing the important charities she works for. Please Emma, if you're reading this don't hide away, do something positive. It can be turned around! Sorry Diane, didn't intend to copy what you wrote and hadn't read yours when I sent mine, but it seems we agree! "Upset, mob pressure, tokenistic gesture, messy public execution, burning at the stake, throwing stones, Emma is hurting, do you want her in the Priory having a breakdown, ‘wanting her dead’, casting her out, making her suffer"
The anger that I feel is not all about Emma, it is all about the dogs, and it is CAUSED BY Emma and perpetuated by your and her replies. Can I explain to you: the issue is not all about you and Emma, and how much you are hurting and upset. You asked for help to put it right, and many people, not just myself, have said that ending her contract is one important step. An editor has two choices in this situation. Either agree with the writer and sit out the storm, or distance yourself from the article and end the contract. It is not pick and mix. You can't distance yourself from the article to the degree that you have done publicly and still expect readers to trust your judgement on future issues. The more you explain how upsetting this is, and yet fail to act to terminate her agreement with DT, the less credible your stance on the subject. And in answer to your question, I don't have an agenda with regard to Ms Milne in particular. I would feel the same and do the same about any writer of a similar article. “Where does it end? Do you want her in the Priory having a breakdown? If your statements were not hyperbole, but indeed reflected your concerns about Ms Milne’s immediate mental health I would urge you as a colleague to encourage her to seek treatment immediately. If Emma is so sorry and hurting, then she should retract her, I'm not sorry, you are all a bunch of idiots who can't read properly, now go away, statement on her website and stand beside you instead of hiding behind you Beverley and letting you take all the flak. I suggest instead of permanately getting rid of Emma from your magazine, as she has obviously been a good writer up until now, she should be given some leave until all of this has been sorted out. rattus rattus wrote: "An editor has two choices in this situation. Either agree with the writer and sit out the storm, or distance yourself from the article and end the contract." This is not an either/or situation. Beverley has rightly distanced herself from the article but it is her decision as to what to do about Emma's writing future with DT. Just because some people writing on this blog have asked for her contract to be terminated doesn't mean that it should happen. I suspect many of these posts were written, in the same way as Emma's article, in the heat of the moment. The majority of DT readers will not be writing on this blog because they have recognised the article for what it was and dismissed it. Please give readers credit for being able to make their own decisions and reach their own conclusions. Do you really believe everything written by every vet contributing to the magazine? Impossible given that their opinions on diet, vaccine etc vary - and that's what is so good about DT as far as I'm concerned - they've moved away from the concept of "infallible- vet-knows-all" to presenting readers with alternative approaches. It is up to us, as readers, to differentiate betwen fact and opinion and, given the presentation of the magazine, this is not difficult to do. The anger at the content of the article I understand, the need to redress the balance is being dealt with in the next issue...surely it's time to move on? I agree that we should move forward to put things right BUT I for one will have no faith in anything Emma will write again. Through out all this one thing can not be argued with is the fact she is a poor journalist. If you choose to write for a magazine you should ensure you get your basic facts straight. I dont want Emma to suffer I simply dont want to read anything she writes ever again. It upsets me to think I will not be able to buy DT again without seeing her arictles...I dont want a public hanging I just dont ever want to hear about this woman or see her work again. Everytime I read a reply from you Beverley, it is full of woe is me, does not answer the questions thta people have asked you and is so written as though you are talking down to people all the time. If you actually answered peoples questions, instead of asking a hundred more based on what can I do, what should I do scenario it may help. Not everyone is fluent at writing as you, but that is no reason to treat people without respect their feelings and sentiments are expressed as best they can. No-one has suggested that they want that 'celeb' woman to die or go into rehab with a nervous breakdown and for you to intimate that they have is not nice. Oh and to be as silly as you.. if you or Emma were up for the apprentice I am sorry SAS would definately say "You're fired"
I understand that you are trying to right something which you are now upset about and I understand that it has been a difficult few days for you and I also understand that it must be stomach churning for you at the moment to have to come on here and read all the comments and arguments, but please try to keep to the subject, be nice to people and don't put people down otherwise this will rage on and on for months and I can't see that anyone will benefit from it and eventually it will stray completely off-topic and descend into a playground battle. In answer to the Anonymous who posted as 18:24, I think Beverley has been exceptionally restrained. This blog only shows what people have been prepared to say in public - there have been worse comments on Greyhound Forums, and goodness knows what has been put in private emails and letters. Beverley has had provocation in spades and has not come out all guns firing. She has been honest and apologetic and at worst mildly exasperated. I don't blame her! Clearly some dog rescuers believe that only dogs and not people deserve a second chance. The outcry about this article has been out of all proportion. How can one article put back Greyhound rescue decades? Presumably one good article could undo all the damage then? No of course not. Also, I think some people need to get a grip and a sense of perspective. Someone who has no power to enforce her views has made some comments that a bunch of other people disagree with. That's all. Over the course of this some people have given in to mass hysteria and struggled to find words to express the depth of their sorrow/betrayal/fury/etc. Also, never have so many people demanding grovelling and apologies and redress and goodness knows what misapplied the word "humble" to their opinion. Meanwhile the world has continued to turn - and out there are real problems. People await hospital tests with life or death news, people cope with family break-ups, financial crises, and elsewhere for some people mere existence is a battle. And Rattus - presumably you had the luxury of making your mistakes out of the media spotlight without hundreds of angry fanatics offering "helpful" opinions. If the UK is becoming more anti-dog, then sticking our heads in the sand and insisting that any breed - however beloved it is to us - is perfect will just make things worse. Realism not indulgence is necessary. I look forward`to the next issue of Dogs Today and hope to read as many positive comments here after it as there have been negative ones recently. Best of luck Beverley - you do a great job, and have demonstrated time and again how passionate you are about dog welfare. "And Rattus - presumably you had the luxury of making your mistakes out of the media spotlight without hundreds of angry fanatics offering "helpful" opinions." Indeed, I had no spotlight for either the successes or the failures it is true, but when one chooses to live in the spotlight why should that spotlight then be turned off, and why should we look away when things go wrong. If the spotlight had been shining on my failures you would have seen action rather than as another poster said, woe-is-me. You say, "realism, not indulgence is necessary". Quite. Indulgence is someone telling angry people that you are upset, busy, that people like me are giving them earache, starting a reply with *deep sigh* as if it is really sooo tedious to have to reply, asking what my agenda is as if genuine outrage is not enough motivation to access a blog (paranoia anyone?). Beverley, and to some extent Emma Milne, are addressing customers when they publish their comments on the net. Customers who do not appreciate being spoken to like rather tedious children who really ought not to be asking awkward questions. This is a market place, there are other dog magazines out there. You also say that out in the real world there are real problems. I can assure you there are real problems for owners of DDA dogs and others not on the list such as rotties and dobes and gsd's whose media coverage has led them to be not entirely trusted by the general public. This list will include greyhounds and lurchers if the ideas in the original article are adopted by the media at large. Tell bull breed owners that their worries are not the real world and are a form of mass hysteria! Media hype about them started somewhere, with negative media coverage, one article ... then another, and another.. drip, drip, drip of misinformation. I hope you did not include me in the people who you claim misapply the word 'humble' to their opinion ..lol ..
"How to help us put it right"
Beverley is asking for your stories & photos to help promote greys in the next issue. If you weren't all so busy criticising (there is another thread for that) you might take the time to do a bit of good for the breed. such as what? People queueing up to be the next TV vet and plotting to depose her? Just seems some people haven't said a word about Greyhounds and have just focussed on getting rid of Emma. In reply to the 'anonymous' last post about Emma. I do not have a hidden agenda about Emma, I am simply a greyhound lover and owner who also volunteers my spare time to dog rescue. I buy DT for enjoyment and that is NOT what I get from Emma. As for putting things right I have sent photos to Beverely and if you read my post I state we should move forward. To suggest dog lovers who are obviuosly upset enough to use their spare time contacting DT have hidden agengas' is about insulting. As I said before I just dont want to see or hear about Emma again, in particular in a magazine I buy for pleasure. jo is right. It is insulting to think that bloggers can't possibly be all that concerned about greyhounds but have a hidden agenda. In Emma Milne's homepage she states "I normally ignore hate mail", in her response to the fury at her article. This is flipping annoying because it gives the impression that complaints about the greyhound article are being filed under Hate Mail about Other Campaigns, which is simply not true. Can people please start using this thread in the way it was intended -to do something positive! There is another thread for everything else. Please see next blog - we've now started editing and designing the feature on cat and dog friendly Greyhounds as we received a wonderful response - enough for several pages in the mag. Thank you to all who took part, some of the photos were little on the small side and Rosie our art editor will be in touch with what you might be able to do to make them a bit bigger. Once again - thanks! Will make a strong feature. I won't ever read your magazine again whilst Emma is writing for it. If you're sincere in what you're saying, then you shouldn't pay money again to somebody who still has not retracted the comments and is insisting it's everybody else who has read the article wrongly. I have 3 greyhounds and have owned them for many years. In that time, they have been absolutely fine with all other dogs, including small ones. I also have had a cat with my ex-racers for 10 years. But I have been bitten by a terrier twice, have seen three children bitten by small dogs, my sister's collie bit a child, and my dogs have been attacked on a number of occasions by Boxers in that time. Why doesn't Emma go the whole way and argue for all breeds to be wiped out? It's never occurred to me to go shouting my mouth off about entire breeds, no matter how upset I was. Pathetic. She should take some responsibility herself and she should pay back whatever money she was given for this 'journalism'. Emma's apology will be in the next issue. Lets hope the majority of people are big enough to accept it. That is good news and thankyou Beverley for the update. I have just read the article - I think she has been wrong to single out the racing dog as being at fault rather than the actions of the owners. She starts by referring to the article the previous week in which she says that culpability lies with the owner first and foremost. Yes racing dogs aren't bred as pets but even if they were it would take a couple of hundred years for those instincts to be bred out, as with other working and hunting breeds owners know that beagles will sniff out prey, huskies will run and staffies will react if challenged thats not to say that responsible owners can't and shouldn't live with these magnificent breeds. I don't think irreprepable damage has been done but I would like to see Emma go and do some investigating with a canine behaviourist working with dog aggressive dogs ( irrespective of breed ) at how they can live safely in a modern society and also get some real facts and figures concerning the actual numbers of greyhounds that leave racing and are rehomed that subsequently have chase issues. so has she been forced to write an apology? If she was sincerely sorry, she wouldn't have defended her actions on her website, and would have come forward and said something days ago now. Sorry,(am i?) I won't believe her. I certainly haven't forced her, I have listened though and I think she genuinely didn't see the damage the article would cause, wishes she'd given more thought to what she wrote, thought more of the consequences. There is certainly regret, she knows how you all feel. Personally I would like to see EM work in a racing kennels for a week. Maybe it would change her thoughts about racing,she would see how much the dogs are loved and cared for.Maybe she could do it at kennelhands wages.The one sticking point would be her licence.. I doubt the NGRC would grant her one. did you get my picture of ruth? I'm glad that you are doing all you can to rectify this problem. I must say I generally avoid reading Emma Milne's articles. As the owner of two bullmastiffs I find many of her views deeply offensive and I try to avoid reading her thoughts whenever I can. Her articles tend to be alarmist and very negative in tone. I'm not surprised she finds it easy to see so many breeds of dogs as dangerous killers of other dogs / attackers of humans / too unhealthy to live. I can't for the life of me understand why you allow many of her articles to be published. Many of them will do nothing other than make readers scared of certain breeds of dog or persecuted if they happen to own those breeds of dog. So E Milne is going to have an apology in the next issue. Is it all she can do? with the back lash her artical has caused. Much more inportant I think is a Statment say she was WRONG and the whole artical was wrong. So when in future some one quotes her rant to me and says that all greyhounds should be killed because there are killers I can turn round and say "E Milne said SHE WAS WRONG"
Please get her to admit she was wrong. I definitely agree with Traceymcl...Although there are some really interesting articles in Dogs Today, I tend to skip over EM's column as it's often pretty negative and not usually of much interest to me. Sometimes I feel as if she likes to try to be contraversial just for the sake of being contraversial. This seems genuinely sad...As a vet, I would hope she gets enough job satisfaction from treating animals (ie doing the job she trained for). I'm actually surprised she still tries to court publicity as the 'tv' vet- I might be wrong be it seems like a very long time since her brief appearance on the tv vet programme (can't remember the name). I hope Dogs Today keeps producing interesting and relevant articles, but I have to say after reading all these posts, I don't think it would be much of a loss if EM's column was dropped. Beverley, please read EM's apology carefully. Her 'Putting the Record Straight' was high handed, and read more like 'Putting the Readers Straight'. There are many different ways of saying 'sorry'. If someone says, "I'm sorry you couldn't make it to the meeting, we were all waiting for you" far from being a genuine apology it subltly implies blame on the other person's part. Please make sure that her apology is a clear acceptance of blame on her part, and not, "I'm sorry you didn't read it in the way it was intended" thereby implying that the readership is not intellectually equipped to follow the subtlety of her argument. A retraction would be better. Ending your association with her would be even better for your credibility as even among your staunchest supporters it is fair to say she has few fans. Here's my dilemma, oh management guru what would you do? The next three articles Emma has written are not opinion pieces, they are reports about a special African dog charity project. Do these never see the light of day to punish Emma? A public sacking for Miss Milne may win your approval, but how does it actually achieve anything for Greyhounds? beverly i think you saying that you weren't aware of what had been said by emma milne is a cop out.The damage that has been done by that vet is unforgivable.Dogs can attack any animal if the notion takes them,,so for VET and a dog magazine to publish this article was a joke.I hope your satisfied now with the setback in rehoming greyhounds this will do.I hope you will no longer be allowing the so called emma 'vet that cant practice.' milne to write for your magazine,,if so your a hypocrite. I have held of replying due to the fact I was very disgusted by this article. However - I don't believe replying in anger does anyone any good and tends to come over very unprofessionally. Sadly this seems to be what Ms Milne was allowed to do. I understand it was a mistake on your part and thank you for owning up to that. I hope that Ms Milne will also learn from this episode and seek to control her temper and emotions in future and try and research facts accordingly. The fact that you are calling the decision a ‘dilemma’ is interesting. A dilemma is a choice between two equally unpalatable solutions. If EM is no longer asked to contribute to the magazine the 3 articles will be lost. On a scale of 1-10 you need to judge how bad this will be. Can someone else raise awareness of the issues? Are the facts available to another writer? Can similar articles be produced, even at a later date? Can you fill the column inches with appeals about other dogs, not necessarily the African dogs? If EM continues to write and you retain the 3 articles what is it that you will lose? You have called it a ‘dilemma’, indicating that you feel something will be lost. Maybe credibility with the readership? The ability to work with someone you trust not to embarrass you? Goodwill of other contributors and advertisers? The feelings of your immediate team of staff. Only you know the full extent of what would be lost if you maintained the working relationship, but your use of the word ‘dilemma’ indicates that it is not a straightforward choice. So you need to score that 1-10 as well. If the two decisions give similar scores it would be useful to factor in how EM would feel about maintaining a working relationship. Although you have appealed for the heat to be taken out of the criticism of EM on a personal level, your support for her on a professional level has appeared to be ambivalent and strained. She hasn’t really helped your situation by going to ground at an early stage, and issuing unhelpful ‘clarfifications’, and your frustration has been apparent and public. I suppose it is a little bit like the question of whether to take donations from people that you really don’t approve of, but which could be put to good use. "A public sacking for Miss Milne may win your approval, but how does it actually achieve anything for Greyhounds?"